A pocket size robot arm to make robotics, electronics and programming accessible to the masses has smashed its Kickstarter goal. 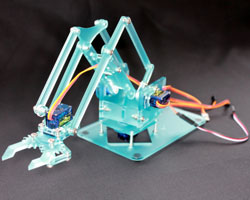 A miniaturised version of an industrial robot arm, MeArm is simple enough to build and use with primary school children, but also enables advanced levels of robotics education. Being open-source, MeArm’s entire design and code files are freely available to download so that makers everywhere can share and enrich their knowledge. There are already well over 250 MeArms ‘in the wild’ in every continent except Antarctica. MeArm can be cut entirely from an A4 sheet of acrylic and built with standard low-cost servo motors. Kickstarter success will enable the launch of the MeBrain, an innovative platform that make it possible to build something low cost ‘with nothing but a screwdriver and enthusiasm’ from May 2015. In order to bring robotics to the masses, MeArm’s founder and open source enthusiast Ben Gray sought the expertise of Des19ncor, a design consultancy based on Loughborough University Science and Enterprise Parks (LUSEP). “We saw a great opportunity to help Ben create a viable long term business” said Martin Croft, Des19ncor’s MD, who has since registered MeArm as a new venture in LUSEP’s Innovation Centre. In addition to the partnership with De19ncor, MeArm has also benefited from the creative expertise in the Studio, the University’s graduate commercialisation hub. Collaboration with the Department of Computer Sciences will strengthen the ultimate goal of MeArm’s widespread adoption by schools, colleges and universities to encourage STEM (science, technology, engineering and mathematics) education. Dieser Eintrag wurde veröffentlicht in Crowdfunding, Development, Education & Studies, English, General, Hardware und verschlagwortet mit free design, Kickstarter, robotic arm von Sebastian Trella. Permanenter Link zum Eintrag.